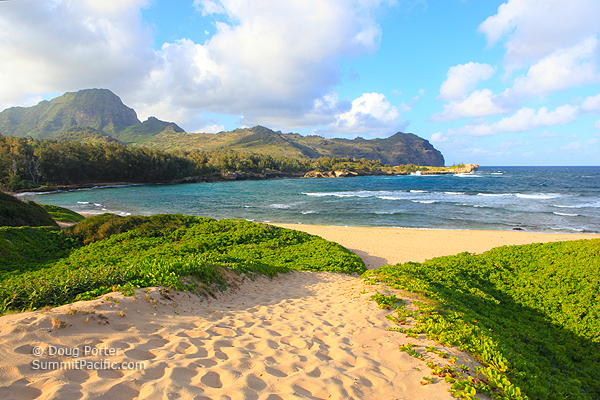 Gillin Beach, also known as Mahaulepu Beach, is located on Kawailoa Bay on the southeast shore of Kauai. Beautiful and remote, access is by way of a long bumpy dirt "haul cane" road over private property and through gates that are locked after dark. The beach can also be reached by foot by hiking north from Shipwreck Beach several miles along the spectacular and interesting Mahaulepu Heritage Trail. The beach is long and backed by foliage covered sand dunes. Mahaulepu Beach is historically significant as it is where King Kalaunuio Hua of the Big Island arrived in his attempted to take over all the islands of Hawaii in the 1300s. After successfully bringing all the other islands under his control, Kalaunuio Hua and his men landed at Mahaulepu Beach and began assembling themselves into fighting order. As they were preparing, Kukona, ruler of Kauai, showed up and showed himself on the ridge near the beach. Kalaunuio Hua and his men hurried to meet him but by the time they got to where he stood, Kukona had moved to another ridge further off. Kalaunuio Hua and his men continued to pursue Kukona until they reached Wahiawa, near present day Kalaheo where Kukona and his men attacked and easily defeated the tired warriors, capturing Kalaunuio Hua. This is how the island of Kauai got its distinction of being the only island that was never conquered. A home located just off the beach was built by Elbert Gillin in the 1950s; destroyed by Hurricane Iniki in 1992 and then rebuilt. Gillin was a civil engineer employed by the Koloa Sugar Plantation. His heirs continue to own it today. 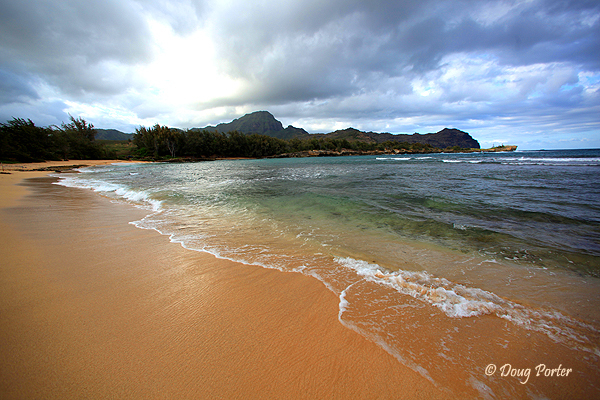 Click to for a list of other beautiful Kauai Beaches.